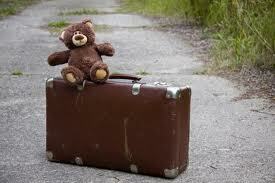 We all bring our childhood experiences baggage with us as we navigate our lives. We can spend the remainder of our lives separating the who am I really from what we were taught; those influences we accepted but now think about often. And we can run into not only obstacles, but illumination, in the process. My parents were pleasantly but not fervently Catholic. They seemed to accept their inherited Catholic faith as true, but they didn't push it on us. Following their parents' traditions, religious dogmatic teaching was left up to the nuns. Maybe this could be thought of as a wall of separation between church and home. I appreciate that. But maybe their policy had something to do with separating themselves from the strict religiously driven attitude of their own parents: children should be punished, should be seen and not heard. Their parents used corporeal punishment to restrict their “natural-born sinfulness.” I think my parents concluded that would have been as destructive to their children as it had been to them. Long before the 60's phrase “Let it all hang out” became common, my parents and grandparents were practicing it. They grew up in tough times and minced no words in being outspoken. That's why, when I met my first wife, I was unprepared for her Protestant inheritance of pretentious kindness to your face, yet knocking or mocking you behind your back. My family was open about liking or avoiding you, leaving judgments simmer until they knew you better. What you saw of us is what you got. I like that. If you don't like it, then consider my father's recommendation to get that feeling “off your chest,” and we can have a debate about it. Of course, he was usually drunk when he said that, but it's workable. I'm an obvious atheist who is tolerated, not confronted. Why is that? Are believers “protecting me by being kind” to me, or are they being kind to themselves, with that attitude? Maybe they think I have an audacious chip on my shoulder. I'm sure they don't want to find out. My parents would defend me, anyhow. So, there. In the tradition of my parents and grandparents, here's some honest talk. Hopefully, it will bring to the sunshine of truth things you hadn't thought about. My grandparents came over from Old Europe on boats. They had it rough before they left and after they arrived, and no time or energy for nonsense. They called it as they saw it: if you cheated them in the butcher shop or humiliated their kids, you'd hear about it. So what if they brought over their baggage of prejudices about Jews and black people. Their children eroded those away over the decades. When they talked about someone who “missed the boat.” it meant more than merely missing a physical connection; it was the feeling of being left behind without opportunity for a new life. My mother used to say that about people who didn't accept the obvious. She didn't have my info to make my observation: those kids raised in fundamentalist home-school homes have “missed the boat.” They're left standing at the dock while the other kids have been sailing on the boats of public education, discovering and extensively exploring the real world. Left stranded at the pier, those young fundie people aren't ready for the real world when they enter it by public high school or college. Speaking of “on the pot” - St. Paul said Jesus arrived in the “fullness of time,” when it was the foolish-est of time. Now's the time. Jesus should arrive ASAP, and when he's killed (as a blasphemer in the Middle East, naturally), his body can be authenticated by forensic examiners, proving his alleged “resurrection” is a con, his body having been found in its burial place after the confessions of his disciples. Now is the fullness of time to prove claims in; not some ignorant superstitious past. I guess that's why faith = hearsay, though. Something else I'm waiting for: an actual miracle.Something else I'm waiting for: an actual miracle. My wife just got back from a week recovering in the hospital. She really suffered from a massive infection. A few days after she came home, her pastor brought us a stew, enough for the next three day's suppers. Very nice. He also brought the well wishes of himself and the congregation. Of course, he prayed over her. When he did, he might have seen me ready to break into laughter; maybe he caught the sarcasm in my smile. He knows as well as I do, but he's counting on the love I have for my wife for my silence. I was disappointed, though. She wasn't immediately cured, leaping about. Didn't his Jesus tell him, “greater works than I do, you will do?” Didn't he cure the bind and crippled on the spot? Looks like Jesus is still “on the pot” along with his clergy on that, after more than two thousand years. “Put your money where your mouth is,” Jesus. So here are a few of those old sayings and adages I remember. Each generation creates its own, including yours. Maybe these examples will help you excavate past ones of your own and re-evaluate them. When doing this, ask yourself if they, though part of your growing-up, really express yourself, your honesty and experiences. You do have access to information your ancestors could never have predicted, and the ability to create sayings to honestly describe it. Well, the only ones left from my immediate family are my “kid” brother, 75, and me. We still carry on some unspeakably honest traditions. In conclusion, I think he'd like this one: It's easy to understand why the Holy Spirit can be a flame, a dove, and a wind. After all, Dracula can morph from an undead state to become a bat or a vapor. They're both fictional. (On the other hand, mom and dad wouldn't appreciate that one. It shows he and I have made progress, though. Neither did our grandparents figure the religious baggage they brought with them would be discarded by us. It's what the freedom they sought included.